SOUTH BEND, Ind.— After Friday night’s contest was cancelled, the No. 19 Florida State Seminoles (16-6, 4-4 ACC) and the Notre Dame Fighting Irish (9-11, 5-3 ACC) squared off in a doubleheader on Saturday afternoon. The teams split the afternoon twin-bill with the Seminoles taking game one by a score of 7-1 and the Irish claiming revenge in game two, 12-3. After three scoreless innings, Florida State opened the scoring with a three-run fourth. Robby Martin got the Seminoles out in front with a 2-run RBI double and Mike Salvatore added an RBI single to make it 3-0. In the fifth, Elijah Cabell pushed the Seminoles lead to five with a home run to straightaway center field. The lone Irish run was scored by Niko Kavadas after an RBI single from David LaManna. Florida State added an insurance run with a moonshot off the bat of Drew Mendoza in the ninth inning to seal the 7-1 victory. Drew Parrish recorded a season-high nine strikeouts in six innings of work for the Seminoles. In game one, the Seminoles pitching staff recorded 14 strikeouts. 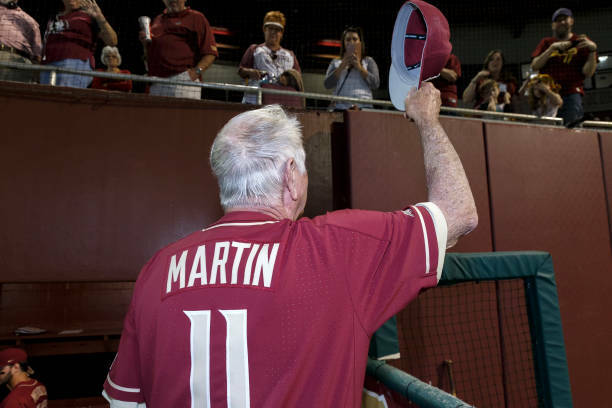 Between games, Notre Dame honored Florida State head coach Mike Martin with a brief ceremony. Following the victory in game one, Martin recorded his 2,003rdcareer victory– the most career wins by any coach in any NCAA sport. With Martin’s career as manager coming to end at season’s end, the Seminoles have recorded 40-plus win seasons and reached the NCAA Tournament in the previous 39 seasons under his leadership. Notre Dame got the offense going early in game two. Kavadas plated Spencer Myers on a sacrifice fly before Eric Gilgenbach roped an RBI double to left field to make it a 2-0 game. The Seminoles got a run back in the top of the second when Cabell scored on a wild pitch. Notre Dame was able to take advantage of defensive miscues from Florida State. The Irish scratched across two runs in the third with a rally that was partially fueled by an error from Mike Salvatore. In the fourth, a throwing error from catcher Jonathan Foster allowed Myers to reach on his sacrifice bunt attempt. Myers came around to score on Jaden Miller’s 2-run RBI single with two outs to push the lead to 7-1. The Irish pushed across two more runs in the fifth inning and three more runs in the sixth and were just three outs away from completing the 12-2 mercy-rule victory. J.C. Flowers led off the top of the seventh inning with a double before Foster pushed him across with a 2-out RBI single to extend the game. Several Irish players broke or tied career-highs in game two. In the fifth inning, Myers matched his career high with four runs scored in the contest. Carter Putz drove in four runs, surpassing his previous career-high of two. Notre Dame starting pitcher Cameron Brown tossed his first career complete game and recorded a career-high ten strikeouts. Florida State and Notre Dame will look to settle the series on Sunday at 12:00 p.m.